Hi, Good Morning. Thank you, friends and viewers. Today I will post how to make spicy mixture recipe. 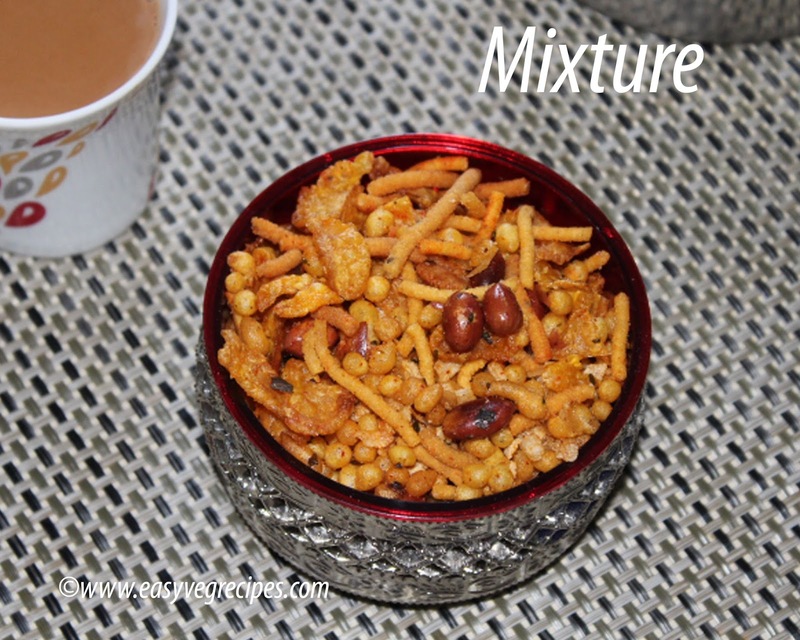 Mixture is an Indian snack item, to be served with a cup of tea. We make different varieties of mixtures. 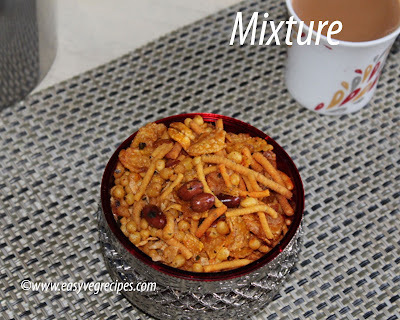 It can be made with dry fruits, simple boondi, poha, and with murmura also. We get this kind of spicy mixture in shops. Some call it simply mixture and some call it Kerala mixture. I really don't know what exactly it is called as. Whatever may be the name given to it, it is tasty and my daughter Sahiti loves very much. She always wants me to make it for her. She even packs it for her snack box also. And she wants me to make spicier added with chat masala and more chilli powder. But I always skip adding chat masala because not everyone in the house did not like the taste. Easy and simple recipe to make. We have to make two varieties of murukku for this so we can have three different varieties of snacks at a time in the house to serve. The mixture, two varieties of murukku, one thick and one thin, and boondi also. I made 1 Kg of the mixture, but you can increase or decrease accordingly. We can add green peas also in it, I did not add because my people don't like it. This recipe I picked it from one of my old friend, Jyothi. She makes it in large quantity. 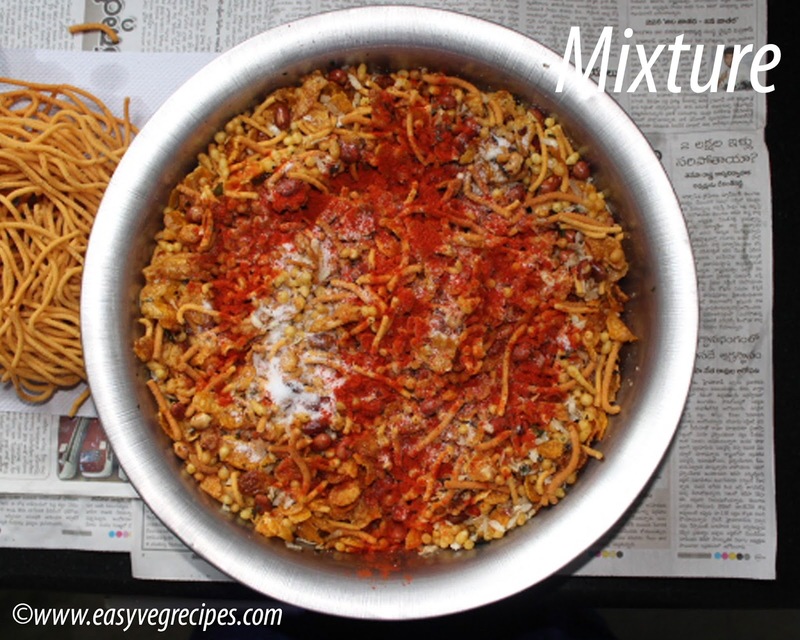 Spicy Mixture -- Mix of different varieties of ingredients. In a wide mixing bowl, mix all the ingredients. Add water to it and make smooth and stif dough with it. Fix thin holes plate in murukku maker. Fill it with the dough and fix the cap. Heat oil in a kadai for frying murukku. Gently press the murukku in hot oil and fry them till they turn golden brown. Once the murukku fried, they will float on the oil and sizzle in the oil also reduces. Take them onto a kitchen napkin. Repeat the same with half portion of dough. Change the murukku plate to big hole one and do the same with the rest of the dough. Prepare all the murukku and keep it ready to mix it with the mixture. Add salt to besan and mix it with water. Make batter with besan without any lumps. Heat oil in a kadai, using boondi ladle, poru batter into a hot oil. Fry boondi till they turn golden brown. Take them off from oil and place on a kitchen napkin. USe it for Mixing with the mixture. Heat 2 Tablespoons of oil in a kadai, fry peanuts/groundnuts till they turn brown. Keep them aside. In the same kadai, fry corn flakes till they splutter and become crisp. Keep them also aside. Again heat a tablespoon of oil and fry poha till they become crisp. Keep them aside. Heat oil again and fry curry leaves till they become crrisp and keep aside. Make boondi and keep it ready to mix it with the mixture. In a wide plate, combine all the ingredients and murukku also. Add enough salt, red chilli powder and black salt. Mix it well so that all the spices coat to all the ingreadients well. 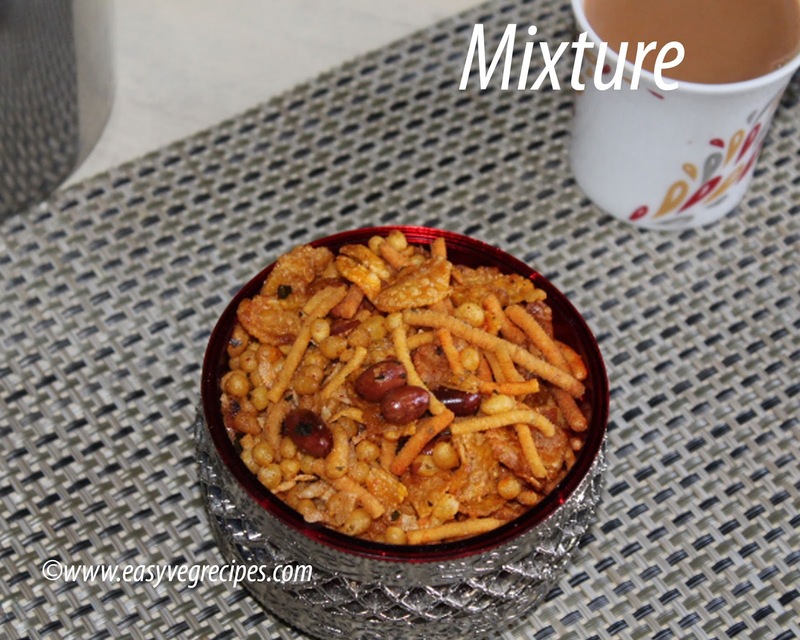 Serve spicy mixture with hot cup of tea.